Whip the egg whites with the icing sugar. Gently combine the dusts using a spatula and make the disks. Spread with Bronte pistachio. Mix all the ingredients and bring the mixture to boil. Combine the lemon juice and pour into the moulds. Put in a blast chiller. Combine yolks, eggs, water and sugar; bring the mixture at 84°C and whip. Combine the gelatine previously soaked and melted, the whipped cream with mascarpone and, finally, the whipped cream. Prepare some moulds - 7 cm diameter and 10 cm high - and pour a first layer of cream; then add some macaroon, another layer of cream with the frozen cherry sauce and close with macaroon. Put in a blast chiller. 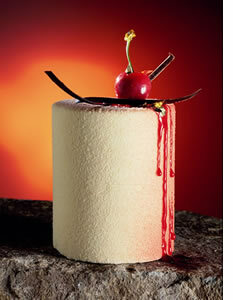 Spray the dessert with white chocolate and garnish with some sauce and a cherry with golden leaf.